Your temporomandibular joints (commonly referred to as the TMJ) may be a small part of the body, but the responsibility they have is enormous – they connect your lower jaw to your skull, essentially helping you perform vital actions like chewing and speaking. Of course, this also means that even the slightest problem can throw the entire system off-balance, resulting in severe symptoms and even debilitating discomfort. Thankfully, Dr. Holmes, Dr. Revel, and Dr. Lowry offer TMJ-related therapy for patients who are desperately in need of relief. Please contact our Pasadena, TX practice today to schedule your first appointment! We welcome new patients from Clear Lake, Deer Park, and other nearby locations. If you’re experiencing any of these symptoms, please let our team at Pasadena Family Dentistry know right away. One of our doctors will be happy to perform a comprehensive assessment of your condition and help you determine the best course of action regarding your diagnosis. 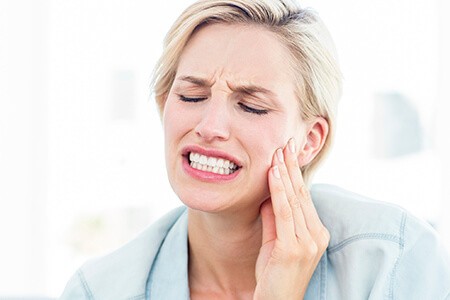 If your case of TMJ disorder is caused by a misaligned or imbalanced bite, occlusal (bite) adjustment can do wonders when it comes to restoring harmony. We’ll alter or rebuild certain teeth with the help of restorative dentistry so that your bottom and top arches can finally meet as they’re supposed to, relieving localized pain. Another popular method for treating TMJ-related pain is the diligent use of an occlusal splint. These appliances are crafted so that they complement each patient’s unique bite, and they’re ideal for patients who suffer from unconscious bruxism. By wearing the splint throughout the night, patients can comfortably reposition their jaw’s resting point and relieve painful muscle fatigue in the process. We may also instruct patients to wear their occlusal splint during the day, but rest assured that your appliance will allow you to breathe, speak, and drink without issue. Over time, many patients achieve long-term improvements with this method!